There are beautiful wedding songs that are played only during weddings. These songs can be love songs, departure songs, blessing songs, etc. During a wedding, there are all types emotions expressed, like love between the couple, joy of the crowd, satisfaction of the parents, sadness of parting between the daughter and her family, etc. There are songs for every emotion. 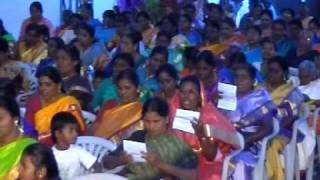 Tamil Christian weddings songs are popular in the Southern part of India. Here, we have collected the famous, old and new wedding songs. Tamil Christian wedding MP3 songs are there so that you can choose any song and listen to it any time of the day from anywhere. These songs are written by Spirit-filled men of God. They are played in most of the typical Tamil Christian weddings, where the traditions are followed with care. Tamil Christian wedding songs free download is sought by many who are going to get married, who have some wedding their family or who is going to sing in a wedding. Unfortunately, it seems like our site doesn’t have a download option. These songs can be enjoyed by listening directly from the site. It is a great way to keep you connected with us.